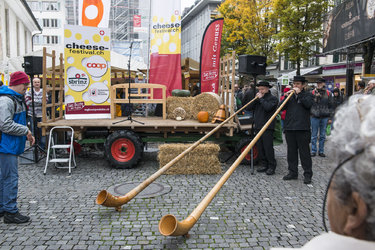 Championships, the 11th SWISS CHEESE AWARDS, and in addition to the public competition, the event includes Switzerland’s largest cheese market with about 70 market stalls and a ‘Chäser-Zmorge‘ (cheese breakfast). At the heart of the festival stands the question of who will become the SWISS CHAMPION. About 900 cheeses in 28 different categories vie for this title. The judging procedure is public and is accompanied by an attractive gourmet tourwith a competition. Sunday morning takes the form of a lavish Chäser-Zmorge with Switzerland’s heartiest cheese buffet and musical entertainment.